When Liane Faulder included Lacombe, Alberta in her list of great day trip ideas from Edmonton in her Edmonton Journal post back in June I felt like the cool kid – because I’ve been day-tripping it to Lacombe, Alberta for years. I was introduced to the central Alberta city when my sister built a cottage at Gull Lake a few years ago. I make a habit of stopping in for bread and treats at the Totally Gluten Free Bakery, digging through the antique shops, and love searching for fashion gems in the not one but two thrift shops in Lacombe. The Spaniard is always a good sport when it comes to exploring Alberta and I had a special treat in mind for his first visit to Lacombe. 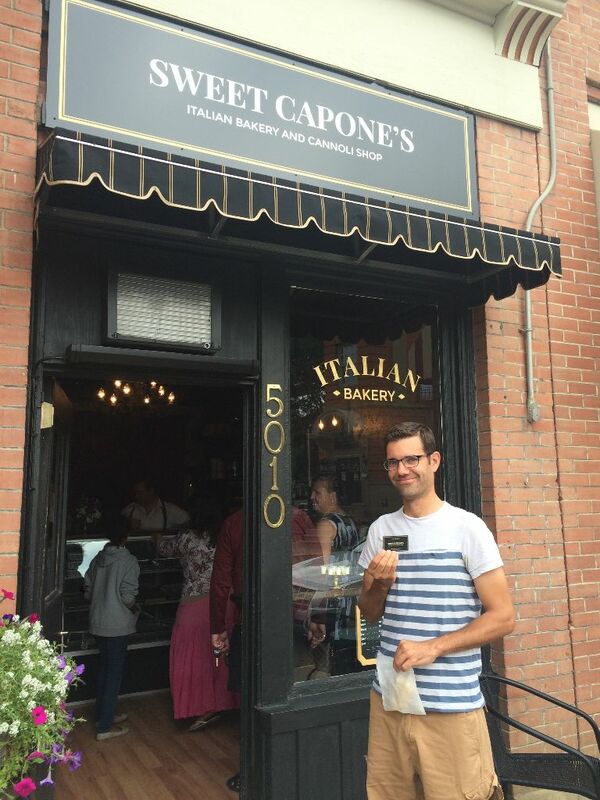 This summer Sweet Capone’s, an Italian bakery and cannoli shop, opened up to rave reviews and daily sellouts. My sister had been lucky enough to score cannolis on a couple of occasions, and warned me that if we wanted to buy anything to get there early. Well, leaving from Edmonton on Saturday morning didn’t exactly go as planned, and we reached downtown Lacombe at 1:06 pm. There were five people in front of us when we got in line at Sweet Capone’s; the window display looked hopeful but we watched as patron after patron took six to eight backs of cannolis for take away. Thankfully, the lady in front of us said – I’ll just take one – and you two can share the last one. Gotta love small town Alberta hospitality. I wasn’t sure what The Spaniard was going to think, as I know he is not a fan of coconut, and that was the only flavour they had left. But he hoovered it and was very grateful that I made sure the gluten-filled stop to Sweet Capone’s was the first that we made in Lacombe. Afterwards we set off to Rangeland Meat Shop, a new butcher shop on the edge of town. My sister had taken advantage of their grass-fed ground beef – 10 pound deal on facebook and she asked us to pick up her pre-paid order. When we entered we told the owner that it was our first time; he explained how the shop is filled with naturally grazed hormone free meats and pointed out some of the unique products they have for sale. We decided to try some of Rangeland’s smoked bison that is cured like prosciutto, but only needs to hang for four months, some bison marrow bones, and a pork garlic ring (all products were great and I look forward to buying them again). Finally, as we were leaving Lacombe heading west on hwy 12, we decided to stop in at S4 Greenhouses. With nothing more than a canning tomato sign to guide us, we found the greenhouse just 1 km down a gravel road. TR Greenhouses are one of the greenhouses that supplies Pik N Pak, and they also have a stall at the Strathcona Farmer’s Market in Edmonton. Once inside there was a small selection of produce piled in baskets on a shelf for sale and we settled on a case of large red tomatoes, flat beans, some beautiful lettuce, and a couple of bags of cucumbers for my sister. Once we were paid up I asked if we could have a quick tour of the greenhouse and we were lucky enough to get a peek. He explained that it was quiet on Saturdays, but from Monday to Friday the place was busy with people picking the ripe vegetables. Some renovations are going on near the entrance, and we learned that there is a plan to make more of a farm store entrance. I absolutely love exploring the cities, towns, farmer’s markets and farms around Lacombe County. I love supporting small businesses, farmers and producers throughout Alberta, and if you ask The Spaniard, Sweet Capone’s is definitely worth turning off the QEII for.